After the last refurbishment in 1994, there had been extensive advances in testing and processing procedures and the adoption of automation technologies. The current fit-out of the Blood Service facility is limiting the capacity and efficiency of the functional areas, with flow-on effects to workflow, OH&S and HR. Significant increases in overall product throughput has been achieved and changes to workflows have been implemented with the introduction of new equipment, however, optimisation of work flows and processes from the introduction of lean manufacturing principles are yet to be applied to this site and is largely the result of the limitations with layout. 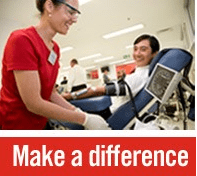 Successful Projects are working with the Australian Red Cross Blood Service in the dual roles of Project Manager and Superintendent for the Complete refurbishment of the existing building at 290 Wellington St, Perth, to bring the control of blood collection, testing and dispatch services into the 21st century and aligned with the national Client brief and TGA validation. This building accommodates the functions of administration, collections, testing and processing of blood and blood products for the state of Western Australia. Detailed planning of staged decommissioning and re-commissioning of services.